It wasn’t my intention to be in Kelso in December, but I decided to go up for a quick family visit before Christmas. To my surprise, this coincided with my favourite Farmer’s Market. Yes, I know I have written about it before in Spring and Summer, but the Christmas one is special, full of holiday cheer, Santa hats and the wonderful winter scents! My first stop was to have a wee chat with Rebecca from Nourish by Rebecca’s. and to sample her delicious raw bites. 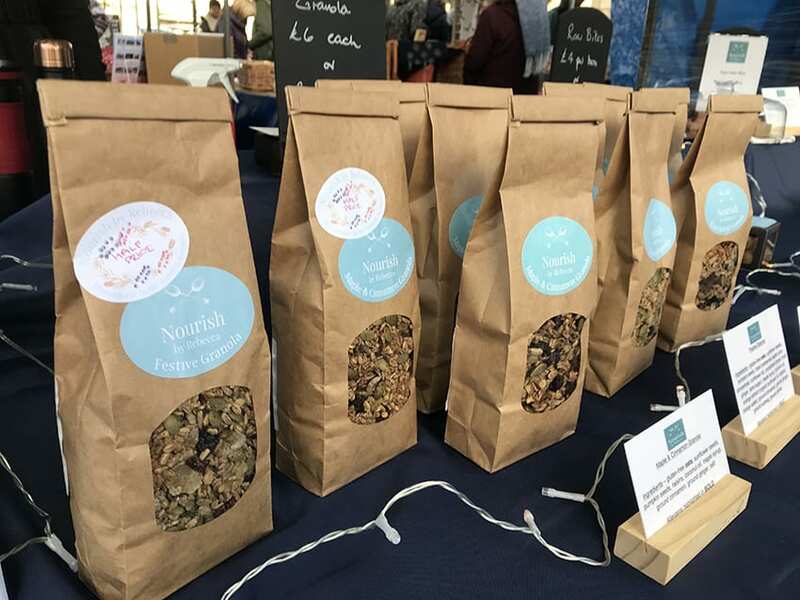 Rebecca produces uber-tasty gluten-free, dairy-free and refined sugar-free goodies. To go along with her Maple & Cinnamon, Apple & Cinnamon and Chai Spiced Granola, she had a tasty Festive Granola. The raw cake of the month was Orange & Cranberry, Rebecca makes a different flavoured raw cake every month. What I didn’t know was that Rebecca makes up Hampers, and although they are mainly available at Christmas, she is happy to make them up at any time of the year. Check out the Nourish by Rebecca’s website for information on classes, recipes and her shop. 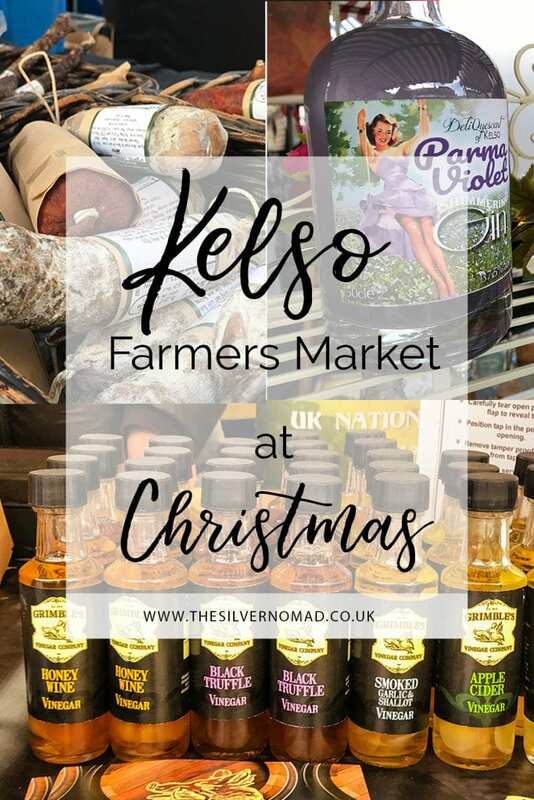 With inviting names like Christmas Pudding, Gingle Bells and Parma Violet Shimmering Gin, who could resist the delights of DeliQuescent Gin? 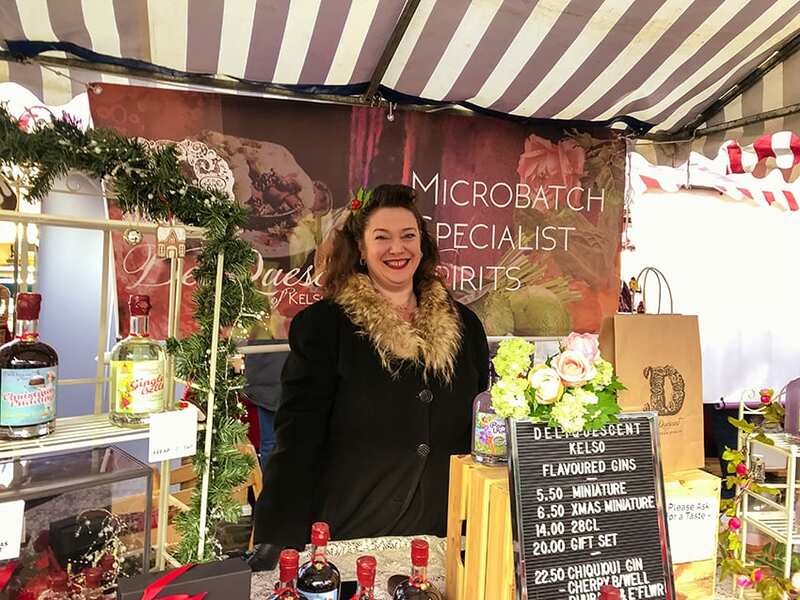 Debbie is the very glamorous lady behind the DeliQuescent brand, and she microbatches the gin in the microbrewery. With flavours will change according to the seasons, the gins are both imaginative and unique. Along with husband Simon, she runs Rutherfords, Scotland’s first micropub where you can also sample the gins. At Christmas time, we can’t forget our four-legged friends. 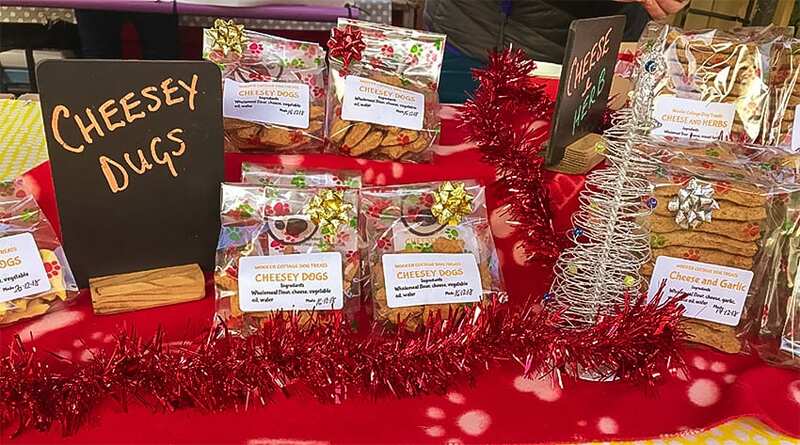 Woofer Cottage make doggy-delicious treats for our canine friends. With flavours including Cheesey Dugs, Cheese and Garlic or Mint and Herb, there is sure to be one for your dog. Contact on their Woofer Cottage Dog Treats Facebook page. There is always a smile waiting for you at the Hardiesmill’s stall. Alison and her family run their pedigree Aberdeen Angus farm on their farm north west of Kelso. The quality of their meat is down to their ethically raised cattle on grass and grass-silage. 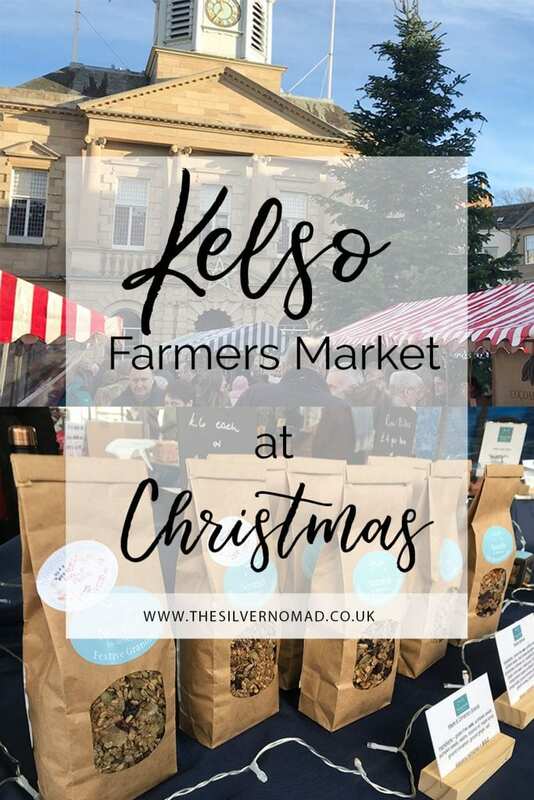 Although most of their business is trade, they do bring a range of their cuts to Kelso farmers’ Market. Check out their website – Hardiesmill. 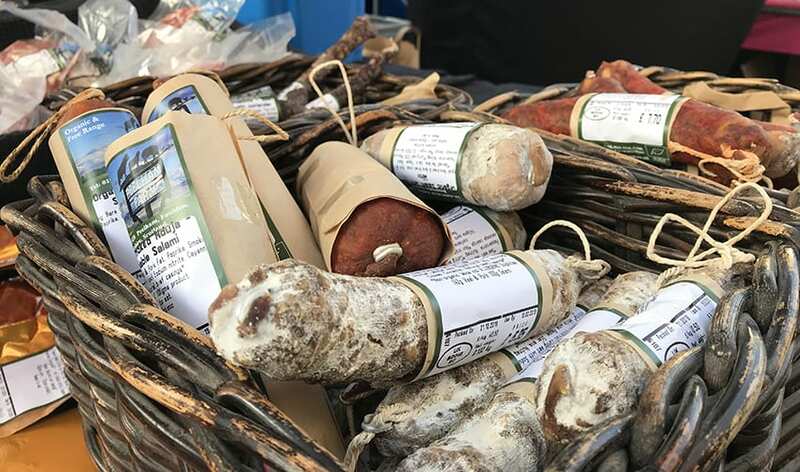 Peelham Farm produces delicious organic and free-range meat and salamis from their farm in Berwickshire. 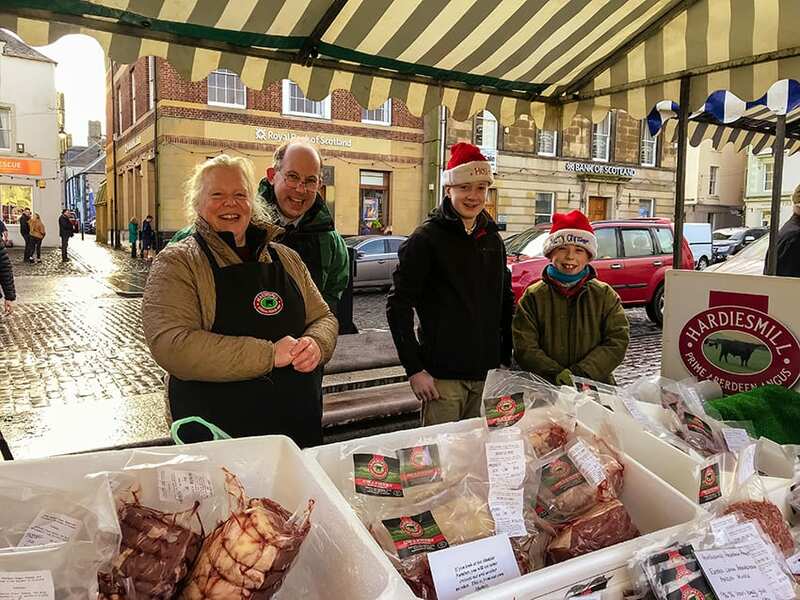 With a range of beef, pork, lamb, mutton and veal as well as their ham and sausages, Peelham also sell meat packs if you can’t make up your mind! 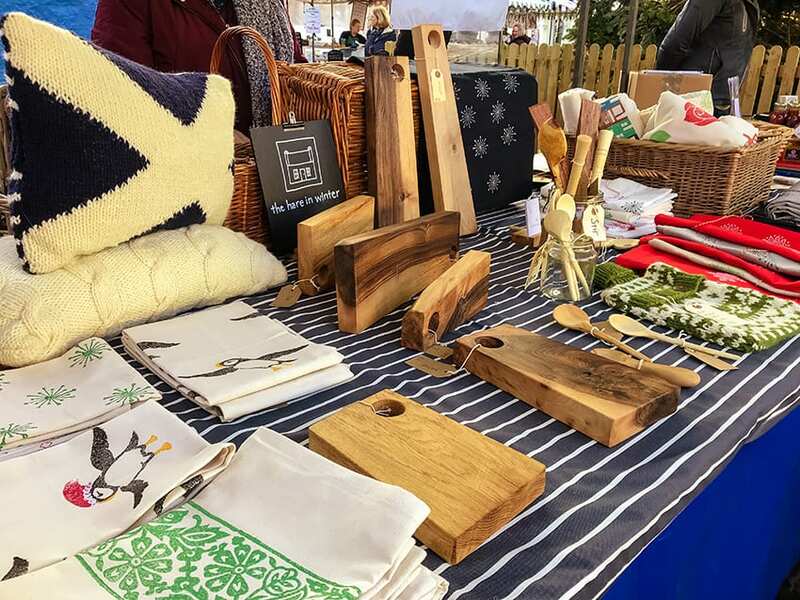 Beautifully handcrafted printed linens, knitted cushion covers and tactile chopping boards and spoons are all available from The Hare in Winter stall and their website. It is always lovely to see Alison’s bright Wonky Woolies stall. The colours she was testing in the summer are now in full production including thislte, tartan and zigzag designs. 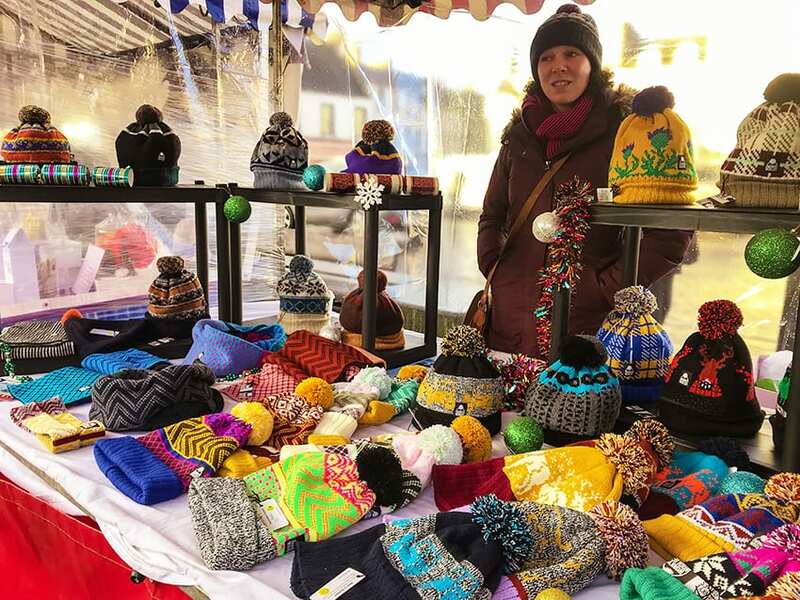 Alison and her team of skilled local knitters make and finish all the hats and scarves by hand and can even great your own personalised hat. Just contact Alison for more details. Chocolate is always a winner, but when you have a master chocolatier making it, you know you are in for a treat! 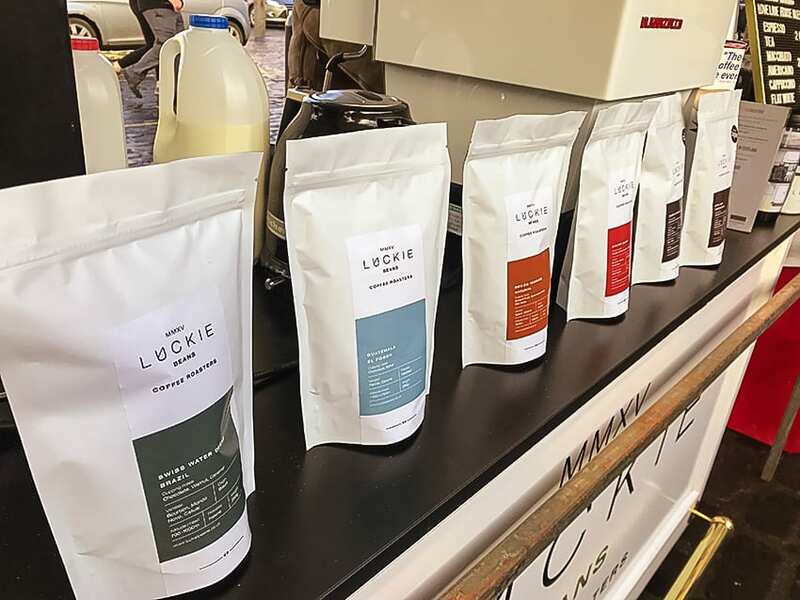 Oliver and Vicky are the couple behind Cocoa Ecosse. 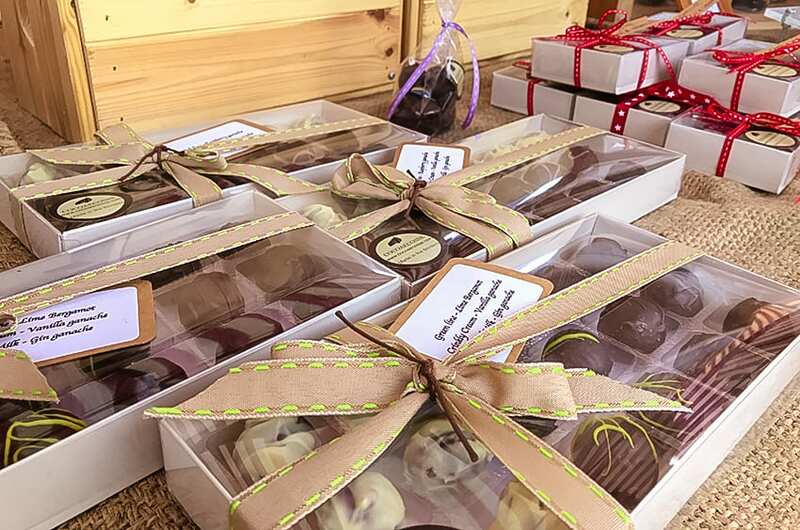 They try to use locally sourced ingredients and come up with Raspberry Truffles or single Malt Scottish Whisky, as well ginger, lime cardamon or even gin ganache truffles. You have to be early to get your hands on one of the golden puffed pastry treats from Osso Restaurant. 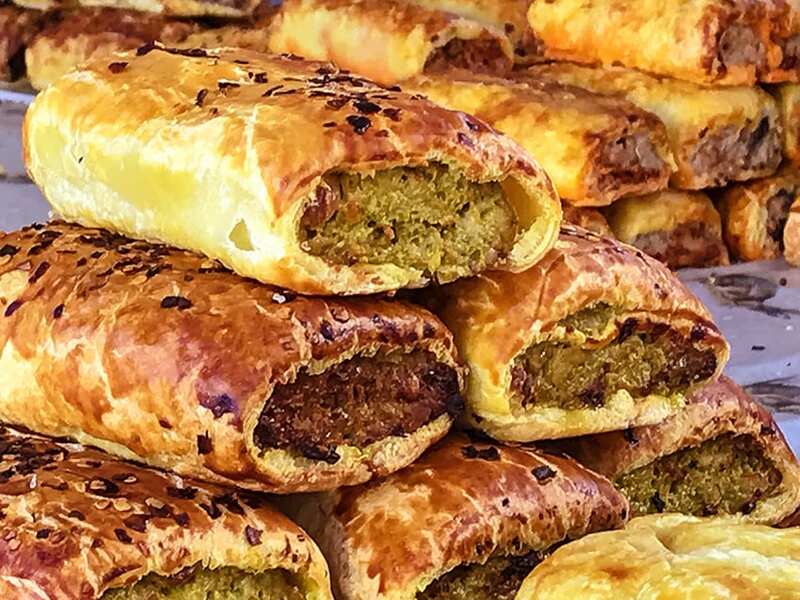 Filled with tantalising flavours such as Haggis with Black Pudding or Chicken with Bacon, and spicy Vegetarian ones there is sure to be one to tickle your fancy. Check out the website at Osso Restaurant. I couldn’t resist a nip of warming non-alcoholic Ginger Wine. The secret family recipe of ginger, lemon and eastern spices was perfect for keeping the December breeze at bay. It can be taken neat or mixed up into one of Kitty cocktails, I fancy a Kitty’s Mule! 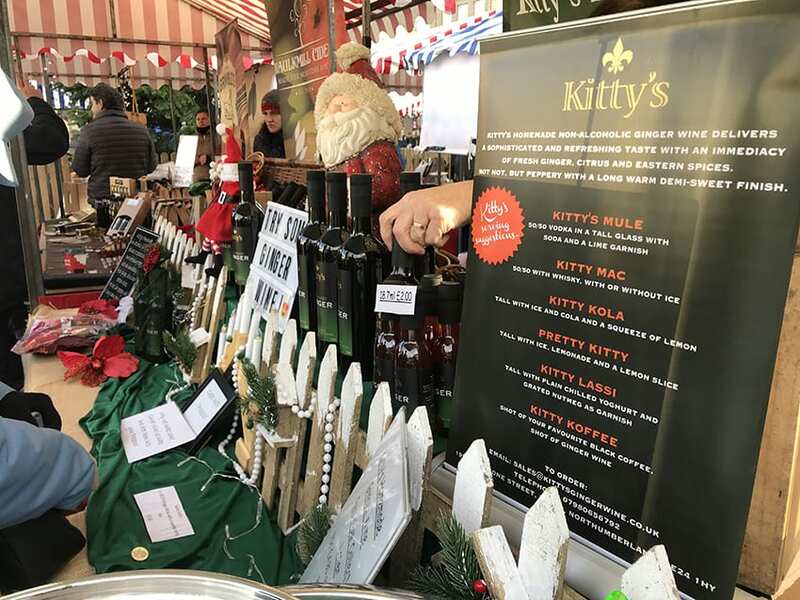 Kitty’s Ginger Wine is available to buy online or at one of the many markets she attends. 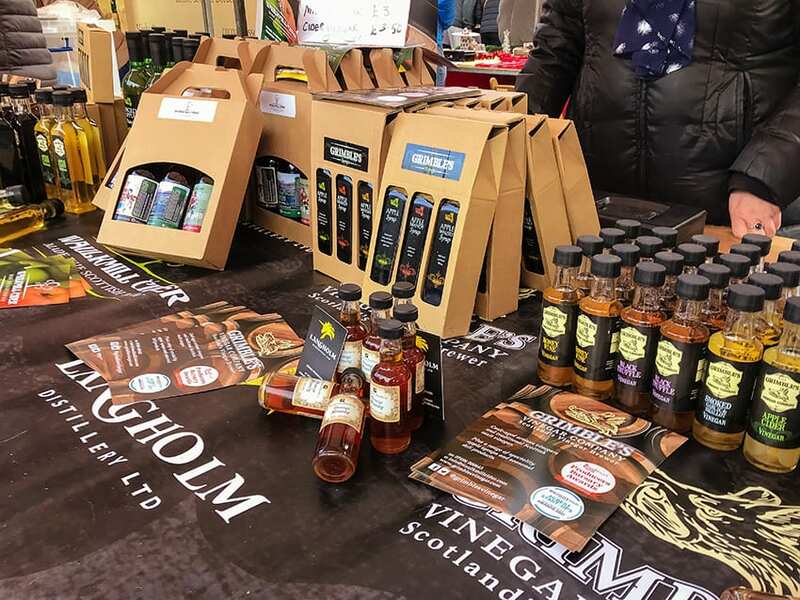 Now artisan cider or vinegar are not two things I normally associate with Scotland, but the enterprise team at Waulkmill and sister company Grimbles Vinegar,have developed both. With a dry Muckle Toon Rosie, the perry Mooseheid, or Steel Bonnet which is a pyder, a combination of muckle toon rosie with the multi award winning mooseheid. For more information check out the Waulkmill Cider website. The ciders come in three dry Muckle Toon Rosie, the perry Mooseheid, or Steel Bonnet which is a pyder, a combination of muckle toon rosie with the multi award winning mooseheid. 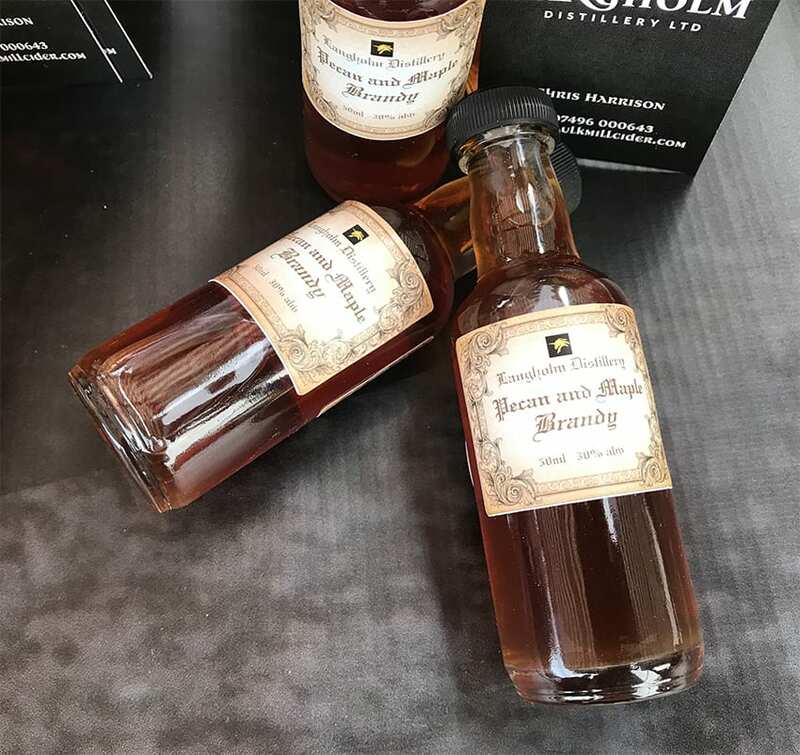 Their latest offering is Pear or Pecan & Maple Brandy which is produced under the Langholm Distillery name. For more information check out the Waulkmill Cider website. 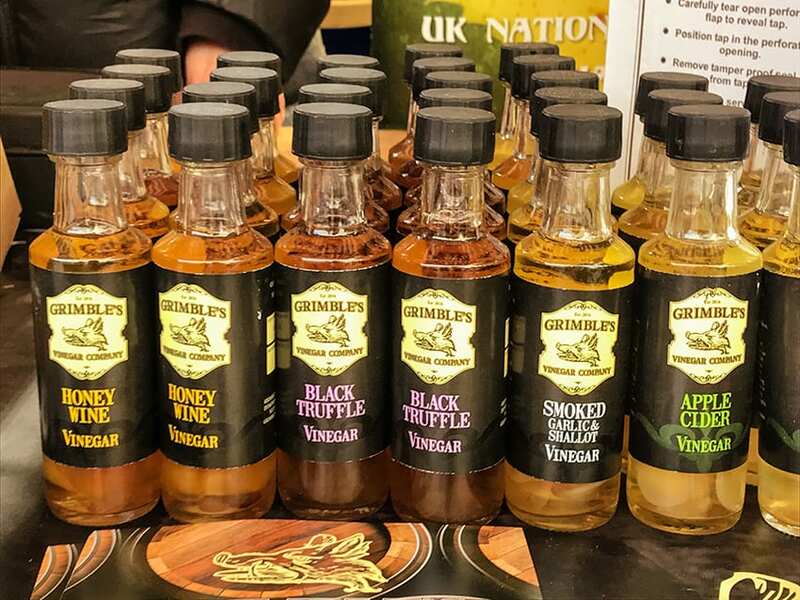 Grimble’s produces Scotland’s only traditional malt vinegar, made from real craft beer, plus a range of continental style cask-aged artisan vinegars, most of them aged for at least 2 years in oak casks for a fully matured flavour. There’s also a range of natural apple syrups and seasonal deli products. For the yummiest cakes, marshmallow pops and brownies, head over to The Dessert Diva. The brownies flavours include Triple Chocolate, Biscoff, Salted Caramel and Cherry & White Chocolate. While the Sticky Toffee and Chocolate cakes look absolutely delicious. Have a look at the Dessert Diva website for more information about their freshly baked cakes, cupcakes & brownies. 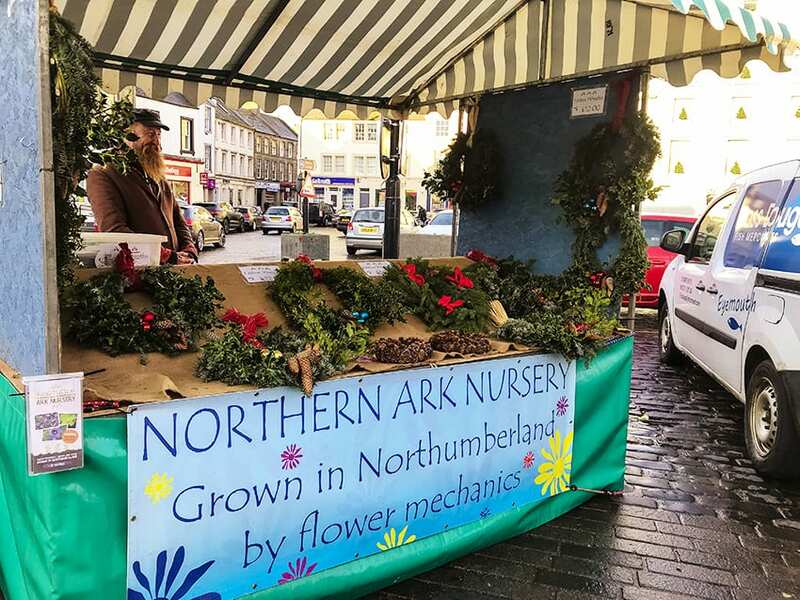 If you are in the Borders area, try to make it along to the market. 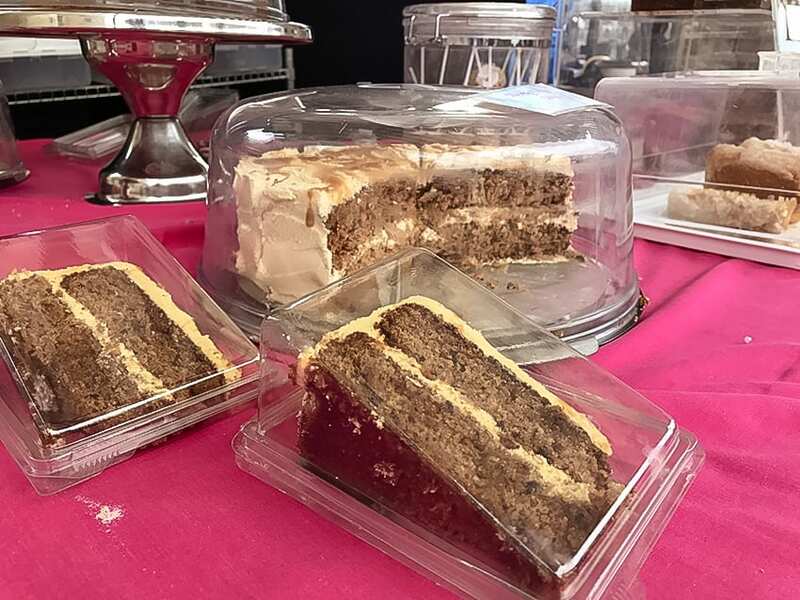 It is on every fourth Saturday of the month in the Square from 9.30am to 1.30pm. 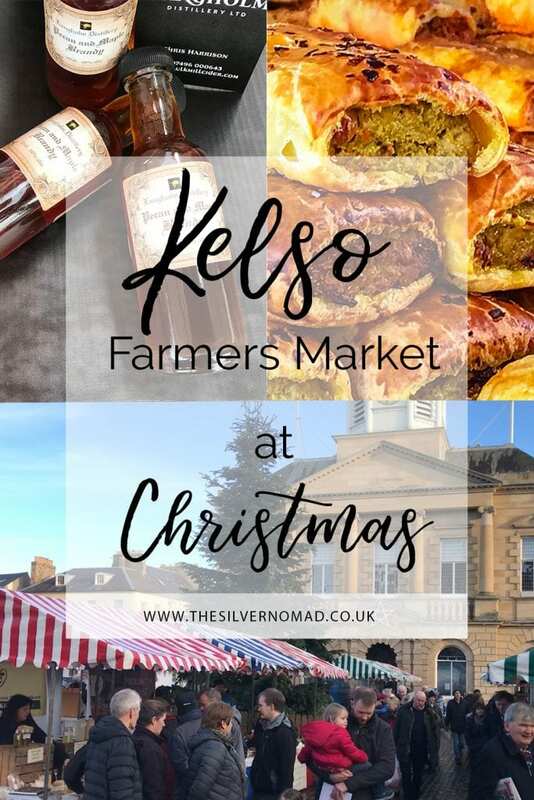 Check out the Kelso Farmers’ Market on Facebook for upcoming dates. 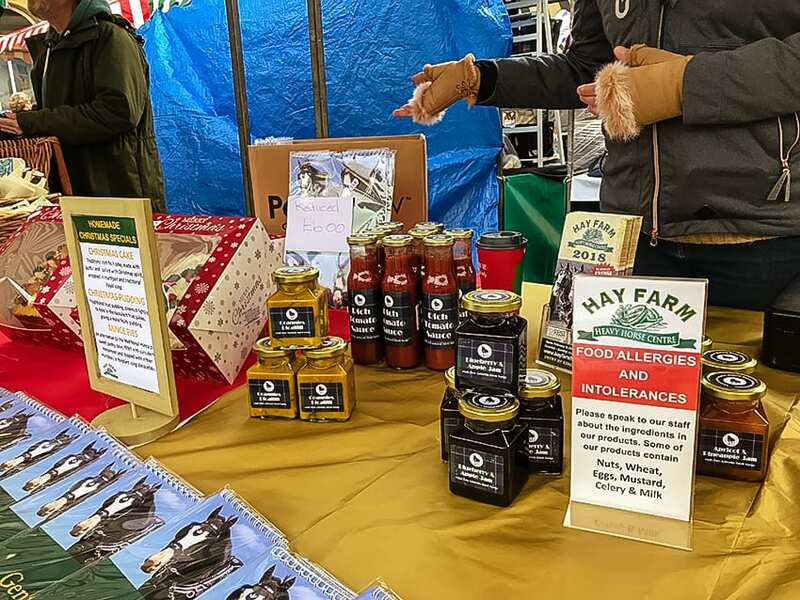 The next market is on Saturday 26th January 2019.